The decorative GreenGate Meryl White Easter egg set of two will brighten up your Easter décor. 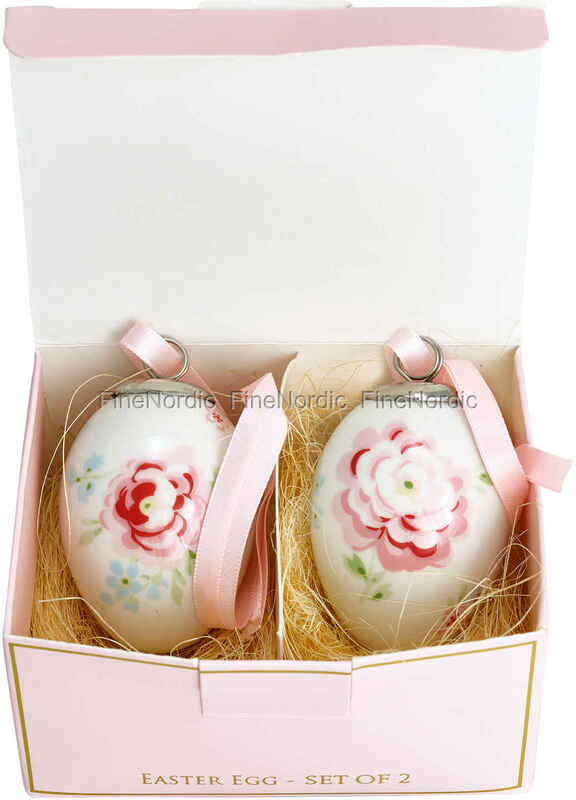 The eggs are made of porcelain and there is a pink ribbon attached to each one of them for easy hanging. They come in a pretty pink gift box and can be used as an Easter gift, or as decoration for the home. Hang them from some flowering branches or from an Easter wreath or give them to your GreenGate loving friend, as a beautiful Easter surprise. Each egg is 6 cm tall and has a diameter of 4.4 cm and they both are adorned with the prettiest flower design. If you like the Meryl White pattern, then you should also have a look at all the other GreenGate Meryl White products we offer in our web shop.